Kenny Dalglish kicked off his obligatory press conference this morning by asking Sky Sports’ Vinny O’Connor if he was comfortable sharing the room with a female journalist. Zing! Kenny rules OK – and he reads the papers. Kenny’s daughter Kelly is a football journo – and a good one too – who once worked with the charming Andy Gray and Richard Keys (more on those two later today), so I’m sure the Dalglish family know all about what goes on behind closed doors/mics at Murdoch Towers. In other LFC tittle tattle, Dalglish revealed that Ryan Babel is going nowhere, literally (and, in terms of his career, metaphorically). “He is staying here,” said Dalglish, that twinkly grimace on his wee Scottish face. So no Ajax move for Mr Twitter. 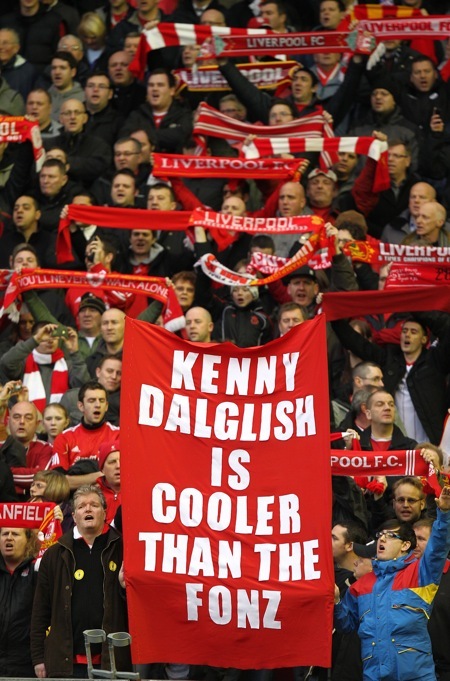 I thought the ‘cooler than the fonz’ banner was an original, circa mid 80`s one – as per the derby ‘flag day’ appeal – hope so or those accusations that we live in the past may give rise to a call for us all to sectioned! It’s a very recent pic, but it may well be referring to an old banner. That makes sense. I don’t know judging by Specky Daves Nevica ski jacket it could be very early mad ravin 90’s ! Acciiiiiiiiiddd ! fuk that jacket made it look like the 80’s…..